Congratulations on your upcoming nuptials! We’re assuming you found this article because you’re doing research on purchasing wedding rings—and you came to the right place. If you already have styles in mind or just want to browse before you decide, there are a lot of high-quality wedding rings that you can purchase online. Yes, it’s a major purchase—an enduring symbol of your love for each other—but don’t let the “online” aspect of this purchase scare you off. You can save a ton of money by buying online and not skimp on quality, guarantees and much more. Use our reviews to find the best online wedding rings. Don’t Know Much About Wedding Rings? You have a lot of choices on the market these days with multiple styles, metals, gemstones, etc. Wedding rings have come a long way over the decades from the simple, classic gold or platinum band. Keep this in mind when you embark on your research. Before going the online route, it might be a good idea to visit a jewelry store or two so you can see in person some of the styles to get a better idea of what you like and don’t like. How Much Are Wedding Rings? You might’ve guessed by now that the cost of wedding rings varies widely, depending on the style you want. You can find a small, classic 14K white gold band for as little as $160 online, but once you get into bands with gemstones and diamonds embedded, the cost goes up (into the thousands). According to weddingstats.org, the average groom’s wedding ring is $468, and the bride’s engagement and wedding rings combined is on average $6,113. We suggest you plan your budget ahead of time to be realistic in what you can reasonably afford. Where Can I Find the Best Wedding Rings Online? With so many websites that sell wedding rings, it’s hard to know where to find the best ones at the best prices. We’ve done extensive research into online wedding rings and engagement rings to give you our choices of the best on the web market. Keep reading to see our picks for best online wedding rings and be sure to check out our Best Engagement Rings Online article if you still haven’t popped the question. James Allen is our top pick if you’re looking for a high-quality but reasonably priced wedding band for the bride-to-be. They have a large variety of styles, from classic to stackable, and a number of different metals to choose from. We love their easy search features that allow you to quickly find exactly what you’re looking for or browse different styles and metals if you’re unsure. James Allen also has impressive bridal sets (engagement and wedding ring combinations), so you can make sure both your rings fit together and look fabulous! James Allen, in fact, is our #1 pick in our review of online engagement rings. Brilliant Earth is one of our favorite online jewelers—not only are their rings exquisite; the company adheres to strict environmentally and ethically friendly practices. Brilliant Earth has more than 40 different wedding bands for men (more than most online jewelers), and all are created using eco-friendly precious metals. Their site also has a helpful “Top 20 Men’s Wedding Rings” section if you’re not sure how to narrow down your search. Of course, there’s a much larger selection of unique wedding bands for women—you can even find antique and vintage wedding rings on their website! We recommend Ritani if you’re looking for high quality but don’t want to put too much of a dent in your budget. Ritani hand crafts all of its wedding bands and engagement rings in its New York facilities, and they even have authorized dealers around the country so you can view your custom ring in person for free before purchase. You can find 14K white gold wedding bands for as low as $160, and they offer 6-month interest-free financing. Ritani’s customer service also gets rave reviews—they’re known for their commitment to service. Be sure to read our companion article, Best Online Engagement Rings, to see our top recommendations for online jewelers that specialize in engagement and wedding bands. You’ll find reviews of some additional sites including pros and cons and other helpful information. Why Choose Your Best Man Carefully? You’ve got your wedding rings, and now it’s time to exchange them at the altar. Check out this video to see how things don’t always go as planned! Is it Safe to Purchase Wedding Rings Online? Although we buy most other items online, it seems a little scary to do so with your precious wedding rings. But don’t be deterred! We hope we’ve given you the information and ratings you need to make a wise online purchase. It is safe—and, in many cases, much more affordable! Happy shopping! Purchase a wedding ring or band online? Whom did you purchase from and how was your experience? 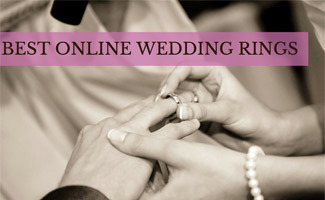 Hello blogger, you share the best information about online wedding ring it very useful info for couples. Thanks for posting such type of informative blog. My husband recently lost his wedding ring during a fishing trip, it breaks my heart but alas we must get a new one! One tip which I didn’t realize is that most ring insurance policies will cover lost/stolen rings so we’ll definitely be signing up for a plan with the replacement ring! Pauline, so sorry to hear your husband lost his ring but good luck with your new wedding ring purchase and yes be sure to insure it this time around!